Add com_the_name_of_your_component in the Match textbox. 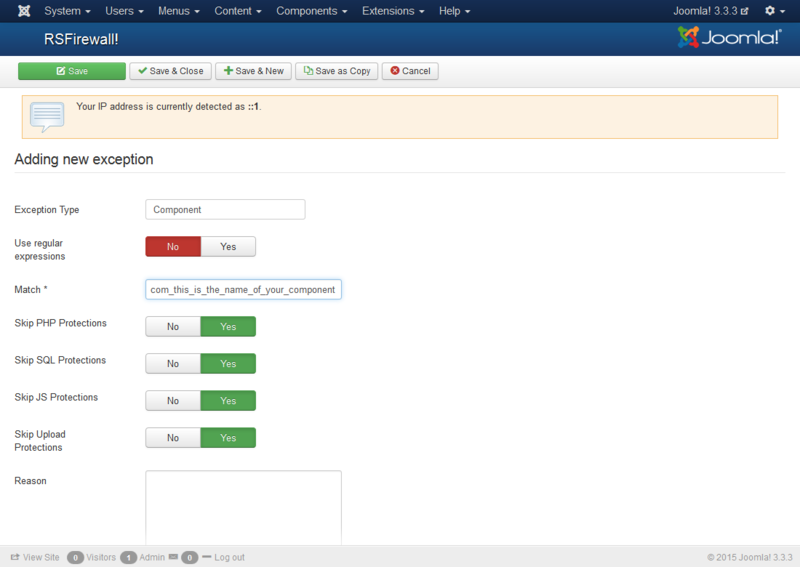 If you do not know the name (it must start with com_ as this is the Joomla! standard) you can go to Components > click on your component and look at the URL in the address bar to find the name. For example, if you'll go to Components > Smart Search you'll notice that the url changed to index.php?option=com_finder. In this case, com_finder is what you're looking for. Set Skip JS Protections, Skip PHP Protections, Skip SQL Protections and Skip Upload Protections to Yes. By setting up the exception described above, RSFirewall! will disregard any potential injection associated with the specified component.